Ducks are aquatic birds that are found in many countries around the world. There are many species of duck, some of which have been domesticated for their meat, eggs, or feathers. Most of duck meat comes from the legs or breast. The leg meat is darker and fattier than the breast meat, and it should also be noted that there is a layer of fat between the skin and the meat. Duck heart, kidneys and liver are also sometimes eaten. Duck liver is sometimes used to make foie gras, which is a type of pâté made from a force-fed bird - although goose liver is more usual. Picks are approximately 2.5" X 1.5"
More Than Gourmet is a food manufacturing company that produces authentic French Stocks and Sauces based on classic culinary tradition. The More Than Gourmet brand is critically acclaimed as the industry gold standard and used by home cooks and in many of the finest professional kitchens in the USA. Our premium roasted duck and chicken stock is reduced to a glace in the hand-made traditions of the finest French classics. More Than Gourmet's insistence on exacting preparation in the old-world style of the French classics has created a duck and chicken stock that delivers pure, intense taste and texture. 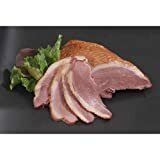 Glace de Canard Gold adds deep flavor and rich, roasted color to your favorite dishes, providing an elegant finishing accent to boost the flavor of your grandest sauces. Its consistent quality and all-natural ingredients bring your dishes a special, smooth taste and flavor. Our high grade Rougie Moulard Duck Legs are taken from fattened Moulard ducks. Raised with 100% grain, vitamins and minerals. DUCK LEG CONFIT - Our Hudson Valley Moulard Duck Legs and Thighs are large and meaty - perfect for braising, roasting, and confit. 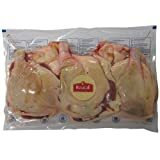 Moulard Duck Legs and Thighs, 6-piece Package. Approximately 5 lbs. Great on Charcuterie plate, in salads, pastas, risotto, sandwiches, or canapes. 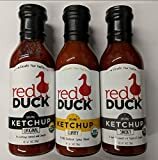 Red Duck Specialty Ketchup Trio #2, 3 Bottles, 14 oz.